Are you affected by work alone regulations and want to be certain your lone workers are safe? Do you also want to minimize your costs and the time it takes to monitor their safety? If this sounds like your situation, then Ok Alone™ is a great choice as your lone worker safety monitoring system. 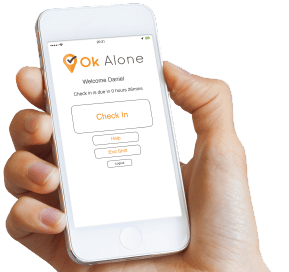 Ok Alone automatically reminds staff if a lone worker misses a check-in. It sends you their GPS location and lets your people set special check-ins for high risk situations. If you want 24/7 live monitoring, it does that too. Why choose Ok Alone monitoring and reporting? 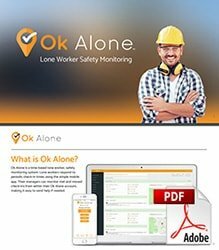 Download our brochure about our work alone solution and find out more about how Ok Alone can keep your lone workers safe. Your team can quickly check-in wherever using our lone worker smartphone app, by SMS text, by phoning in on an office or home phone or having Ok Alone call them. Ok Alone alerts your monitors to missed check-ins with emails, phone calls, sms messages or whichever combination works best for you. Don’t have any monitors available yourself? The Ok Alone 24/7 call centre will escalate missed check-ins or help requests according to your instructions. The Ok Alone lone worker app uses GPS positioning to pinpoint where your staff are, even when they are on the move. This makes it easy to find them quickly in an emergency. The daily location report also shows you where they have been, which can be used to confirm to your customers, your team are where they are supposed to be. Our 24/7 call centre deals with your missed check-ins and help requests when your monitors aren’t available. But you control when you want Live Monitoring to be on or off. This control significantly reduces your costs. Don't spend any more than you have to on your work alone app & safety monitoring. Ok Alone gives you everything you need, just as much as you need, at a lower cost than any similar system. Complete packages for up to five workers start at just $25/£20 month, that’s $5/£4 per person. If you’ve got a larger work force, the per worker price falls from there. I like using ok alone. It is a easy app to use. I have never been in trouble while using this app but I have had a few times when I had forgot to check in and a operator has called with in minutes of me missing my check in to ensure I was safe. I feel very safe using your service and will feel safe using it the future. Thank you for your service and keep up the good work. I tested a few other apps but once I tried OK Alone I didn’t try any more. OK Alone was the easiest to use and had the best settings options to fit our needs. The support was great too, with any questions I had always answered quickly. OK Alone has been a valuable tool for helping to ensure our technicians’ safety. Both as a monitoring device for our office, and as accountability for our techs to keep their safety in mind throughout the day. Support has also been great for any user issues we’ve run into. 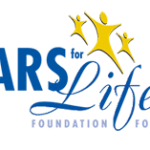 Great product for a very important cause! My experience with OK Alone has been great. I can easily make adjustments and update lone workers in the laboratory or in the field. It works well with android and iOS systems. 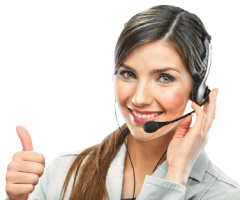 OK Alone is extremely user friendly and has worked flawlessly for Kemira. Ok Alone provides us with an effective and economical solution to meet lone worker regulatory requirements. The app is simple and straightforward to use, and was easily understood by our diverse workforce. We rely on Ok Alone to monitor the well-being of our staff. I contacted the OK Alone team after hearing of them from a partnering municipality who was pleased with their service. At the time we were shopping around for a service which could provide working alone options at a reasonable price. OK Alone met all our needs, providing the service we wanted at an affordable price. I have happily referred other municipalities to their service. Chris Moore, Sulzer Mixpac (UK) Ltd. I would like to take a moment to express our total satisfaction with the OK Alone check-in system for monitoring staff. Monitoring staff who work alone has never been easier. With Ok Alone’s “smart phone” app you get personalized professional protection that includes many adaptable features such as individualized employee programing, GPS location services, live monitoring…… all at an affordable price! It is extremely simple to use, requiring minimal training. 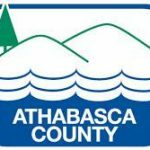 The Aspen Regional Water Services Commission requires Staff to check on the process and to ensure it is running optimally, 24 hours a day – 365 days a year. With only three operators, Staff are often required to work independently. The System works well for us and it meets our time and cost effectiveness needs, helping to track Staff at work and ensuring everyone returns home safe. Our organization has found the OK Alone app added to the staff’s security. We find it easy to operate and like knowing that our staff are safe and able to connect with us if they were in need of support. Upon researching ways to keep staff safe when working alone, this was the most cost effective method that met Worksafe BC’s mandate. Using the OK Alone system, I am confident that our staff has continuous communication in remote areas. Their system is easy to use and allows each worker to have a unique escalation procedure. 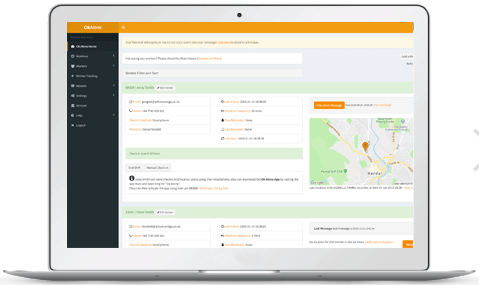 Incident notifications are immediate with excellent online reporting for incidents, messaging and worker stats. Use the OK Alone system if you have any concerns for the safety of your staff during operations. We love the Ok Alone working alone solution. 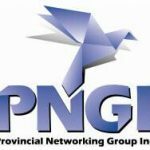 It allows us full control of our working alone protocols with an easy to use and cost effective solution. With the support of the OK Alone App, we can ensure that our employees stay in contact and are safe at all times. I really don’t know which is my favourite feature, but the high risk check-in is right up there! The system is flexible and accommodates different types of employees. Issues are bound to happen, but I love how promptly they get fixed. Finding the OK Alone system was a huge relief for our organization. It allowed us to save significant costs while not compromising on safety of our staff. The website and app are easy to use and staff were very quick to respond when we had questions or concerns. The app is straightforward for both workers and monitors to set up and use, and importantly for staff, is not disruptive to their working day. I wouldn’t hesitate to recommend it to anyone with similar requirements to ourselves. Ok Alone has made monitoring much more manageable for us, the app works great for our organization! Ok Alone is a simple to use, effective tool. It keeps our staff safe while working on their own in the community. We especially like not having the worry of extra data costs on our agency cell phones. The Ok Alone system has given our department a strong sense of security. It’s easy to operate, follow up and ensure our staff is safe at all times. The Ok Alone system is reliable and cost effective.